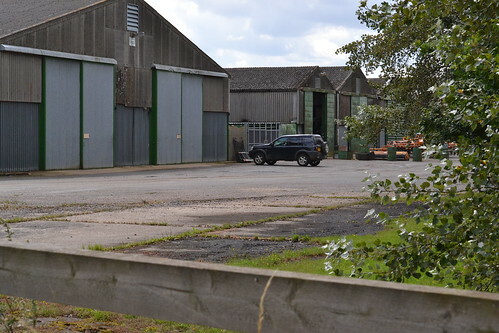 Around the borders of Cambridgeshire and Northamptonshire in an area near Huntingdon, are a group of airfields that are synonymous with target marking. ‘Pathfinder country’ is an area rich in aviation history and played a major part in the European Theatre of Operations. Our first visit is to RAF Warboys, home of the Pathfinders. Hidden behind Warboys village adjacent to the A141, lies RAF Warboys, an airfield that played a major part in the Second World War. The farm sign reminds us of the aviation link. The airfield itself, was initially constructed as a satellite for Upwood and had three runways one of 1,250 yards and two of 1,100 yards. There were 24 frying pan hardstands (2 of which were used for hangar bases) and 18 loop style hardstands. 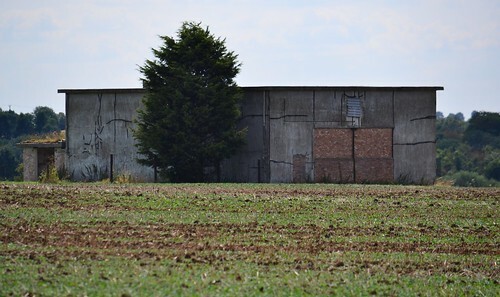 As with most airfields of this time there were 2 type T2 hangars one each side of the airfield, a bomb store to the west and eleven domestic sites either side of the A141. The site would house up to 1,959 men and 291 women. However, before the airfield was completed, the order came though to extend the runways to 2,097 yds, 1,447 and 1,350 yds. This meant moving the perimeter track layout and diverting the main road around the airfield as it would be dissected by the new extension. The remnants of the main runway are used for buildings. Opened in September 1941 as a bomber station, it was used by Short Stirling’s from 15 Squadron, as an overflow from nearby RAF Wyton. However their stay was short-lived and they were soon replaced by Blenheims of ‘D’ Flight, 17 OTU (Operational Training Unit) based at another local station, RAF Upwood, on 15 December 1941. These remained at Warboys until August 5th 1942 where upon Wellingtons of 156 sqn, 3 Group arrived. 156 sqn flew these Wellingtons until December 31st, when they were replaced by the Lancaster Mk I. The airfield had a turbulent time, seeing several changes of squadron and aircraft during its life. The Lancasters of 156 became the founders of the new Pathfinder Squadrons, an elite force designed to locate and mark targets for following bombers. They remained at Warboys completing training and operations for a year, before being moved to RAF Upwood in March 1944. These vacating aircraft were replaced with yet more Lancasters from the Night Training Unit from Upwood and then in March 1944, Mosquitos from 1655 Mosquito Conversion Unit. Warboys became a mecca for heavy bombers, new crews and training now became Warboys’ main focus for the rest of the war. 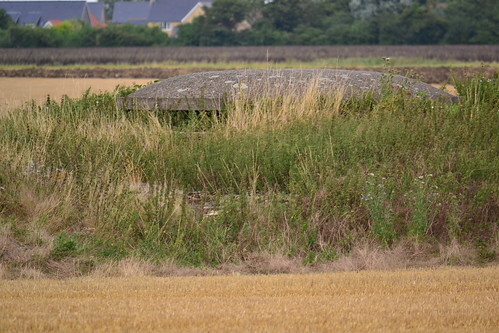 Airfield defence in the form of an ‘Oakington’ pill box. The first operational duties for Warboys crews were on the night of August 15th 1942 (the night the Pathfinders were officially formed) and continued until training duties took over. Through its operational activities, Warboys suffered high loses, many of which were experienced or senior crew members. A total of 99 aircraft were lost consisting of 16 Wellingtons and 83 Lancasters. The first major casualties occurred on that very night (15th August 1942). Of eight aircraft that took off, three returned early and one was lost. Further operations were carried out on the 17th/18th (Flensburg) and the 27th/28th (Kassel). It was on this operation that the Pathfinders suffered one of their greatest losses. 31 aircraft were missing of which 14 were Wellingtons and 3 were from 156 sqn. In the first month of operations Warboys lost nine crews in all. Buildings mark the edge of the bomb site. Not all operations were as bad. On the night of 19th/20th September following action over Saarbrucken, flares ignited in the aircraft of New Zealander Sqn Leader A. Ashworth. After instructing his crew to bail out, he managed to extinguish the fire and fly the aircraft back single-handed landing at the fighter station, West Malling, in Kent. Further operational casualties mounted. Raids on Berlin, Brunswick, Munich and Frankfurt saw heavy and sustained losses, to the point that 156 sqn became known as the ‘chop’ squadron and consequently, morale fell. With a 15% chance of survival, morale continued to be an issue and the station was stood down for a short period. In a desperate attempt to bolster the men’s spirits and raise morale, a royal visit was arranged for the Queen. Further buildings survive near the bomb site. Operations continued and a final fling saw a hectic period between 20th and 25th February 1944 with major targets such as Schweinfurt and Leipzig coming under the spotlight. 156 sqn lost 7 crews in total in all these operations again many were high-ranking or experienced men. Aircraft casualties were not just restricted to operational duties. On 28th September 1941, a Stirling piloted by Wing Commander P.B.B. Ogilvie of Wyton’s XV squadron, crashed when attempting to land in poor visibility. Luckily there were no injuries to the crew, but the aircraft was written off in the incident. Further accidents included a crash at Methwold when returning from operations and another on the 15th November when a Stirling crashed on take off laden with bombs. A further crash later that month, saw another Stirling (piloted by a New Zealander Flight Sergeant J.F. Baron) crash due to failing engines. In all these accidents, remarkably only one crew member was ever killed. The final operational flight came on 1st/2nd March 1944 and took 156 sqn to Stuttgart and then three days later 156 moved to their new home at nearby RAF Upwood. Post war, the training units were disbanded, and all flying had ceased by the end of 1945. The RAF did return briefly with Bloodhound missiles in 1960 staying for 4 years until the airfield was finally closed and sold off. The site today houses a two small industrial units, but it is primarily farmland. Only a small section of the main runway exist, and this has farm buildings upon it. This section, has been cut by the original A141 now a ‘B’ road and evidence of the runway can still be seen either side of the road. 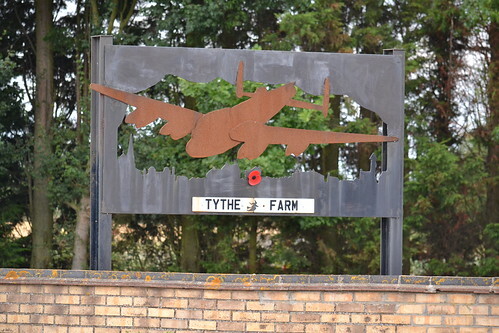 The farm entrance has a large sign with a Lancaster modelled out of metal. Two memorials on the gate posts mark the runway. If you look to your right, you can see the extension to the runway and the remains of a small building, but probably not war-time due to its location. 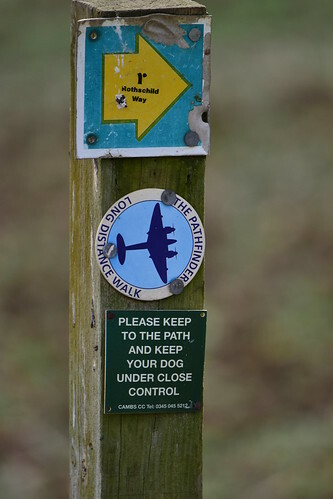 There is luckily a footpath that circumnavigates the field called ‘The Pathfinder Long distance Walk’ and uses that iconic aircraft, the Mosquito, as its icon. This path allows views across the airfield and access to some of the remaining buildings. Entry to the path is toward the village a gated path that is actually part of the perimeter track. As you work your way round to your right can be found one of the few Air Ministry designed pill boxes. The manufacturer of these mushroom defences being F C Construction, they were designed in such a way as to allow machine gun fire through a 360 degree turn. Often referred to as ‘Oakington’ pill boxes, there are only a few remaining today. Industry marks the south-western perimeter. 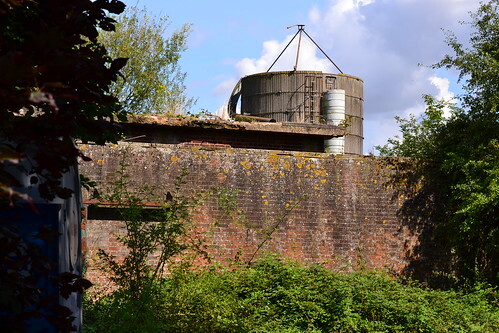 Also, deeply shrouded in hedges and undergrowth, another bunker and the remains of further buildings also stand here watching over the airfield and surrounding countryside. With permission from the farmer, you may be able to access these, but they look in rather a dangerous condition. Further along to your right is where one of the T2 hangars would have stood before its demolition. Tracks lead away from here, and there is, what appears to be, further examples of airfield architecture buried amongst the tress. The perimeter track takes you around the rear of the airfield across the threshold of the main runway and round the perimeter track. 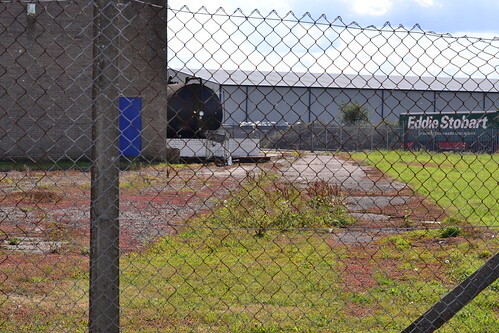 A local model flying club now use this part of the site between the runway and peri track. To your right would hae been the bomb store, now open fields laden with crops rather than bombs. There are a few buildings here marking the boundary of the store, now used for chickens and extensively ‘modified’ by the farmer. They house farm machinery a far cry from what would have been here some 70 years ago. The track then takes you away from the site and out across the Cambridgeshire countryside. The remains of the Ground Control Interceptor (GCI) Radar Station. Returning back to the road, we go in the opposite direction from the village and come to the entrance of the industrial site. These buildings stand on the perimeter track marking the western corner of the airfield. Next to this part of the site, is a large telephone transmitter, apparently the origins of the site being 1941. Whilst its use and history is somewhat difficult to locate or verify, it is known that this was a Ground Control Interceptor (GCI) Radar Station used to lock fighters onto incoming enemy aircraft. Later, there was a high-powered transmitter here used by RAF Mildenhall and RAF Wyton. It was also used to communicate with the V bombers on long-range flights. The mast believed to be original, has been updated and refurbished for telecommunications purposes, but the block house remains behind high fencing with very strong padlocks! Photos are available of these elsewhere. The majority of the admin and technical sites are located along the A141 toward Wyton, some evidence exists here but the majority have long gone. Return toward the village and find the church; located just on the outskirts of the village. 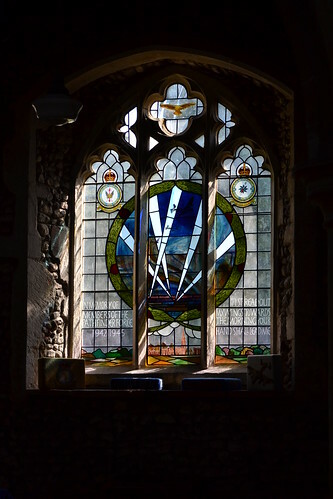 Memorial window dedicated to the Pathfinders. A superb memorial window and roll of honour can be found here, and it is well worth the effort. Warboys had a short life, but as one of the founder stations of the Pathfinder squadrons, it played a major part in the Bomber offensive against Nazi Germany. Many young men left here on a voyage to far off lands, often flying alone, in the dark and in secret, they performed one of the most vital roles in the latter parts of the war and it’s a role that should not be forgotten beneath waving crops and developing industry. A website detailing crews, missions, aircraft and other information about 156 squadron is well worth visiting for more specific and detailed information. After we leave Warboys, we head to her sister station to the west, and an airfield with a history going back to World War I. 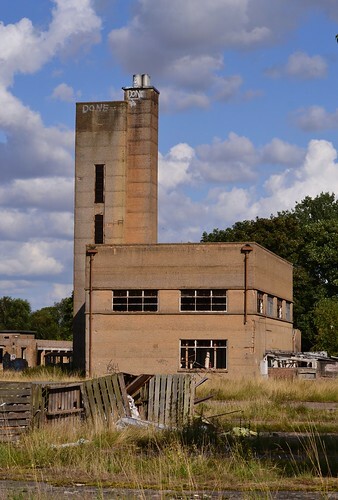 Located in the western corner of Cambridgeshire not far from RAF Alconbury or RAF Warboys, RAF Upwood is possibly one of the most photographed stations in the country, partly due to the fact that it closed fairly recently, but more so because virtually all the buildings are still intact. A remarkable site, it was preserved by its use by the USAF Medical Service as a hospital until it’s closure. Guard house to the former airfield. Resembling a ghost town, it is an eerie and strange place to visit but its life may be ending soon. 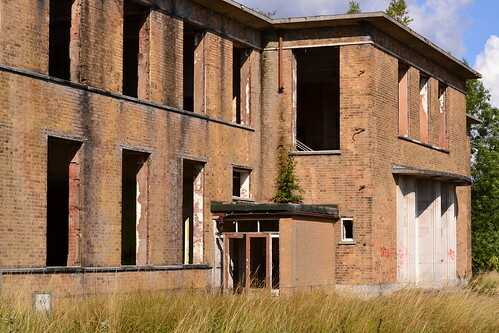 RAF Upwood was originally opened in September 1917, as Bury (Ramsey) after the adjacent village. It had no permanent buildings and was a grass airfield with no fixed squadrons. Toward the end of the war in 1918, five hangars and a small number of huts had been built and it was at this time that it became officially known as ‘Upwood’. When the war ended, the squadrons left and the site was cleared, being returned to the local community once more. However, the impending conflict in the late 1930s, required a massive rethinking into Britain’s defences and the need for greater air power. A number of locations were earmarked for opening and as a former airfield, Upwood was one of them. Designed as a medium bomber station, plans were in place for as many as five large hangars. The first operational units to arrive were Hinds of 52 Squadron RAF, followed later by 63 Squadron RAF. Being very much outdated, these were replaced quite soon by Fairy Battles, themselves to prove to be outdated very quickly later on. Being moved away from Upwood, the ‘Battle’s allowed Blenheims of 90 squadron to move in on September 20th 1939, and Avro Ansons in the following month. Having no concrete runways yet, the weather and poor drainage proved to be the worst enemy at Upwood, causing very difficult operations and often cessation of any flying activity at all. Eventually, the two Upwood based squadrons would merge forming No 17 Operational Training Unit (OTU) in April 1940. Upwood was to experience some rather difficult times and localised action. Numerous accidents were interspersed with attacks by marauding Luftwaffe aircraft and a parachuting spy. This event led to much excitement around the base. The spy, Josef Jakobs, was found guilty of treason and later executed at the Tower of London. 17 OTU would later, in 1943, transfer to Wellington bombers, but it was decided that the poor soil would not permit sufficient support for the aircraft and so they moved out leaving the airfield devoid of all operational aircraft. The RAF then placed the airfield into care and maintenance, passed over to the new 8 PFF group and by the end of October three new concrete runways had been constructed. The first Pathfinder Squadron (139 Sqn) moved in early in the new year equipped with Mosquitos from nearby RAF Wyton. The pathfinders would target a number of high-profile targets including: Berlin, Cologne, Dortmund, Frankfurt, Hanover, Mannheim and Brunswick. Often flying singularly or in pairs, they would mark targets for the larger force following on behind. Post war, Upwood served as a hospital and all of the buildings survive. Gradually as the Pathfinder force grew, so did the number of resident aircraft at Upwood. On March 5th, 156 Squadron joined from Warboys (See above) following a series of disastrous raids and heavy losses. 156 Sqn ‘won’ the dubious award for having the highest losses in bomber command. The high loss rate continued for some time, and many experienced crews were lost to enemy action. On June 21st, 156 Sqn started daylight raids attacking flying bomb sites. They also continued the onslaught of German cities and industrial targets in an aim to stop, or at least slow, arms production. Having to travel further into the heartland, 156 Sqn were to experience new and harder fighters. One such experience was the new Messerschmitt 262, on the night of 8th /9th February 1945, Germany’s last-ditch attempt to stop the allied bombing campaign. Operations finally came to a close for 156 Sqn with the last raid on 25th April 1945 to Wangerooge, just off the Dutch coast. It was to be a rather distasteful ending with seven aircraft being lost, six in mid-air collisions. 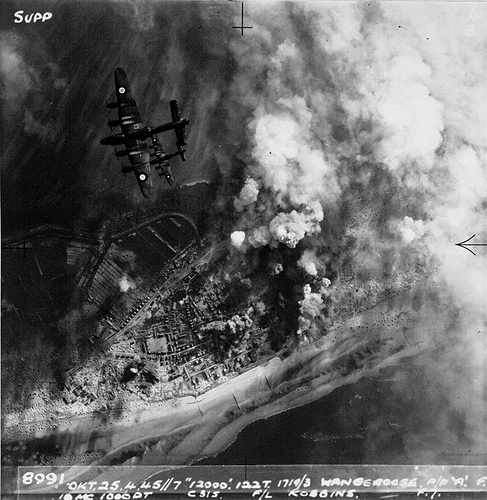 Aerial photo taken on 25th April 1945 over Wangerooge*. 139 Sqn meanwhile, continued their night raids on German cities having their busiest month in May that year – 256 sorties. Mission continued on right up to the end of the war. During the period late February to Late March, 139 Sqn carried out 36 consecutive night raids on Berlin. At the end of March, they were involved in the largest ever attack on Berlin by Mosquitoes, when 142 in total flew in two waves over the German city. Their cessation of operations didn’t come until May 1945 following a 14 strong attack on Kiel. A huge number of derelict buildings remain on the now abandoned site. Throughout their operational tour, 139 Sqn had lost a total 23 aircraft in 438 raids , the highest of all the Mosquito PFF squadrons. 156 Squadron on the other hand, carried out a total of 308 raids (4,230 sorties) losing 143 aircraft – 913 crew members in total. During 1955 / 56 the Lincolns were gradually replaced with the new Canberras. A number of squadrons including: 18, 61, 50, 35 and 40 all had a place at Upwood, until on September 11th 1961, the last operational unit left. RAF Strike Command made some changes and then in 1964 they too pulled out leaving a small care and maintenance unit behind. Oer the next few years Upwood would be used for training of non flying training duties, until they too left in 1981. Upwood’s future looked insecure. Inside the Gate house, the USAF presence. (Security Police Squadron). Control for Upwood was then passed to the USAF for training and support services from nearby Alconbury and Lakenheath. It was earmarked for medical services, and should an attack occur during the Cold War, it would quickly be turned into a control area ready to deal with heavy casualties. 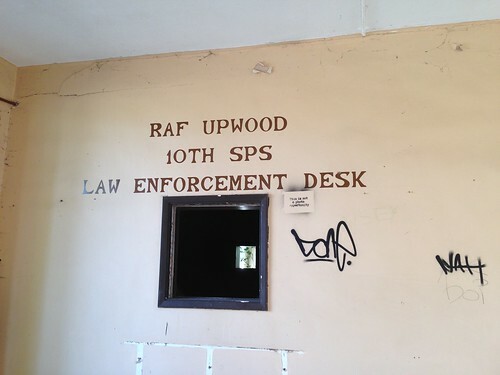 The USAF gradually phased out its use of Upwood, as other airfields closed, crew number became less and the homes they used emptied. Eventually, even 423d Medical Squadron pulled out, taking their community support, equipment and staff with them. Upwood finally closed on 26th October 2012 and the remaining buildings including the NAFFI and NCO homes were all sold off to developers and the site wound down. Today it is a ghostly figure, an enormous site covered with buildings as if left following an atomic blast. The windows are all shattered, the buildings vandalised and graffiti daubed on all the walls. Two tanks have been brought in and a small Urban Assault company use it for mock battles. The guardroom, officers quarters and associated mess halls all remain, some in a worse state than others. 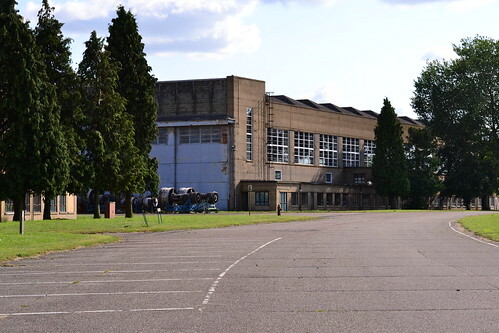 RAF Upwood’s hangars are still in use today. Aero engines outside await work. 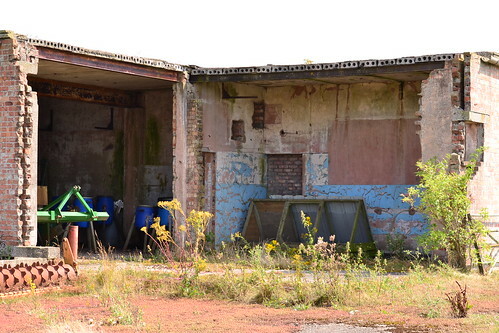 On the positive side, the hangars are actively used by an aero-engine company who refurbish jet engines, a glider club has been agreed a 10 year lease on the remaining parts of the runways (although these have been removed) and two Nissen huts have been fully refurbished to allow modern use. This part of the airfield looks and feels like a real and active military base, whilst the admin and medical side a ghostly reminder of its past. Standing on the site looking around, the imagination can only begin to think how this lonely and desolate place once bustled with aircraft engines, crews going about their business and vehicles ferrying aircrew to their machines. Ever since the site was sold, numerous plans and buyers have come forward, but nothing is certain and no one seems to know exactly what the destiny of Upwood is. 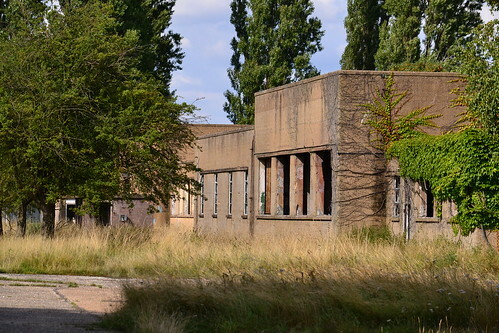 One thing is for sure, if it is left and eventually demolished, it would be a tragic missed opportunity to preserve a once thriving military base in the heart of England. 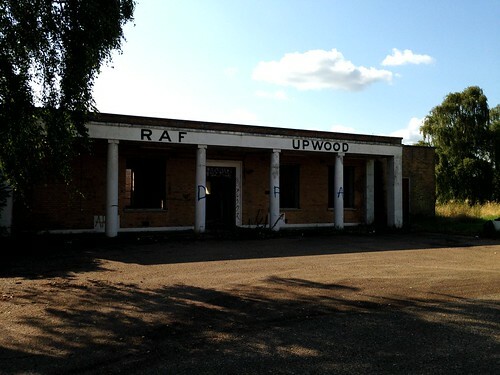 A website dedicated to RAF Upwood shows a range of older photographs, squadron details and information about Upwood’s history. Created by Sean Edwards, it is well worth a visit for more specific details. A local gentleman has purchased a scrapped Canberra nose section that once flew from Upwood and has rebuilt it. It remains in his garage and is displayed at shows around the country. There are further photos and videos on my flickr account. *Photo from the UK Archives, (https://www.flickr.com/photos/nationalarchives) no known copyright restrictions. Just checked on Wiki. I knew Oakington was a refugee reception centre – I see that it is now a housing development with the first 1500 of a planned 9,500 houses under construction as of 2014. Hi Frank. The places listed are those I’ve personally been to, rather than listing all which is probably nigh on impossible – I’m bound to miss some! There are a large number on the ‘to do’ list and I’m working my way through them – slowly. Sadly many of these places are earmarked for housing, one of the reasons for doing the blog (and the personal visit) is to see for myself what is still about, and record what I can in the time that I have. Thanks for the info on Oakjngton – another one bites the dust! Couldn’t find Oakington anywhere on your site – I would have expected to find it under Pathfinders! I first read about the Pathfinders in a novel as a young kid. It was fascinating to recall that read and fuse it with your blog. Great job, friend! Thank you very much for your kind words. I’m glad you liked it and that it has some meaning to you.